At the great PowerPivot FAQ PowerPivot experts from across the globe answer all kinds of questions on PowerPivot. So my idea was wouldn’t it be great if we could have a live FAQ session at SQLPass EU! Since 2 moderators are at the SQLPass EU this year i decided to contact the Pass committee, they liked the idea as well . So without further ado: The great PowerPivot FAQ will be coming to you at the SQLPass EU this spring. 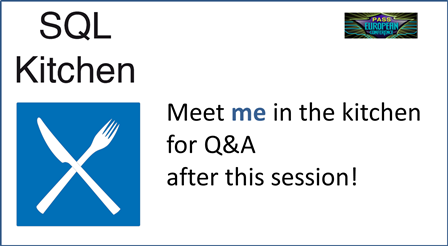 Wesley Backelant (from Microsoft Belgium and also moderator at the FAQ) and I will be having a PowerPivot FAQ session at the SQLKitchen at SQLPass EU. Since this idea was kinda last minute the date and time aren’t available yet but i’ll keep you posted ! Maybe we can have other experts to answer questions as well. Of course questions that aren’t in the FAQ will be added on the spot !